Built upon Photron’s Emmy award winning high speed video camera success, the FASTCAM SA5 once more raises the bar on what a high speed camera should be capable of. 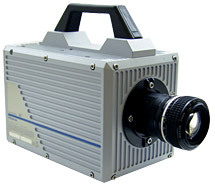 Providing a staggering 7,500 frames per second (fps) at mega pixel resolution and reduced resolution operation to one million frames per second, the FASTCAM SA5 delivers unsurpassed light sensitivity (ISO 10000-test compliant with ISO12232 S sat) and dynamic range through its 12-bit monochrome (36-bit RGB color) sensor with twenty micron square pixels. The FASTCAM SA5 is provided with a remote control keypad, complete with built in five inch LCD screen for full, computer free, operation. And our award winning Photron FASTCAM Viewer (PFV) software comes complete with Software Developers Kit (SDK) for users wishing to integrate camera control, replay and download into their own dedicated software.